In the first part of this article, we have taken a good look at the perfectly located villas away from it all. In the second , we have found beautiful places to stay if you want to be close to all the action. This time, we will see what lies in between. Maybe you have already seen the towns and want to enjoy the natural beauty of the island. Maybe you enjoy the quieter but not completely quiet surroundings. When you want a relaxing and peaceful holiday but are not yet ready to go for total seclusion, the following beauties might be just what you need. These are places close to nature but not too far away from the towns. They offer privacy without solitude and the most diverse selection of fun activities to try out and enjoy. CHOOSE IF: you feel you need a taste of tranquility before you fully commit. AVOID IF: you already have a firm idea of the type of holiday you want. Consider booking one of those and enjoy the best of both worlds. Thalassa has a divine position in Rosohotnica Cove, right along the sea, just 5 minutes’ drive to the town. It is a lovely, quiet area with no crowds even in high season. Villa’s amazing interior design features an eclectic mix of Bohemian chic and contemporary elements. 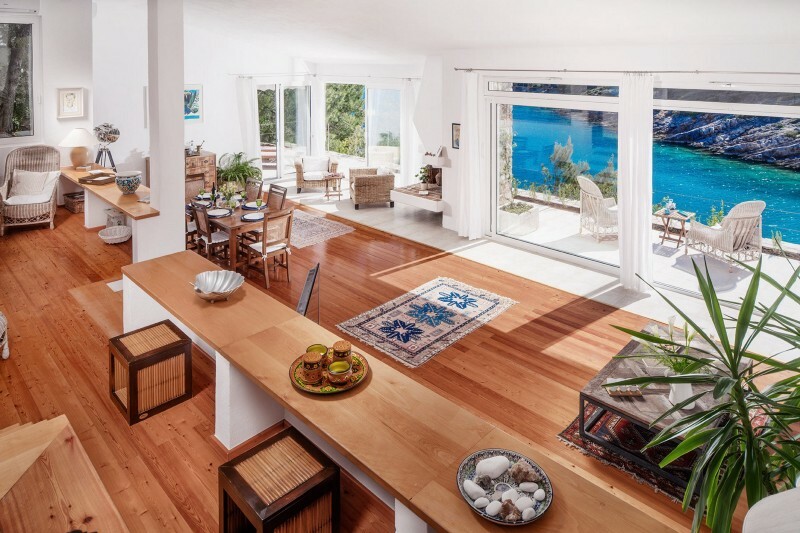 Glass walls in the living room bathe the interior in pleasant light and offer a lovely view of the cove. With a stone staircase leading from the villa directly into the sea, an invigorating swim is literally just a few steps away. To round off a perfect, relaxing, and hassle-free stay, Thalassa offers amazing housekeeping services. Put your feet up and enjoy your time on Hvar! Maia is the crown jewel of Sveta Nedjelja, sitting pretty beneath the shadow of the highest mountain on Hvar. Sveta Nedjelja is the premier wine country of the premier wine region in Croatia, so if you have a passion for the grape, you will find much to enjoy here. The villa charms with the blend of old world style and modern comfort. But the true enchantment follows as you take a moment on the spacious terrace and behold the incredible vast blueness of the sea and the sky. When you step down to the pool to catch a tan lounging in the built-in ledges, enjoy the fact that you can see everything while not everyone can see you. The interior of the villa is filled with light, the surfaces are made with carefully chosen materials, like travertine stone, full wood, and velvet. There is a pleasant warmth to Maia. Something that makes her a place where you immediately feel like home. You will feel a comforting sense of exclusivity and privacy as soon as you see the high stone walls protecting the villa from the outside world. Eirene is one of the oldest stone houses in the charming village of Dol, turned into a luxurious mansion with highly stylized interiors and exteriors. In the warm days, so plentiful on the island, you might enjoy spending most of your time in the outdoor living area, equipped with much and more for your enjoyment. After dining, accompanied by a glass of chilled wine from the cellar built in a natural cave beneath the villa, relieve the stress in the steamy hammam or take a dip in the heated pool. 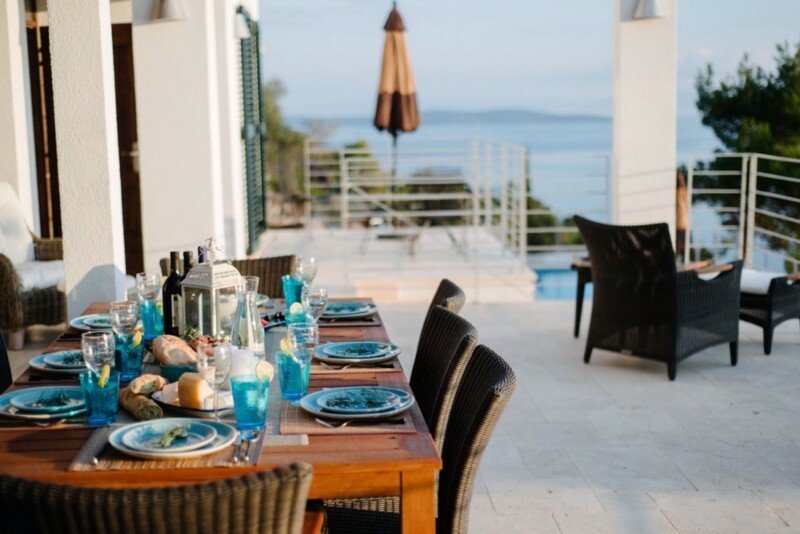 Beautiful sister villas are located in Pitve, around 5 minutes from Jelsa. 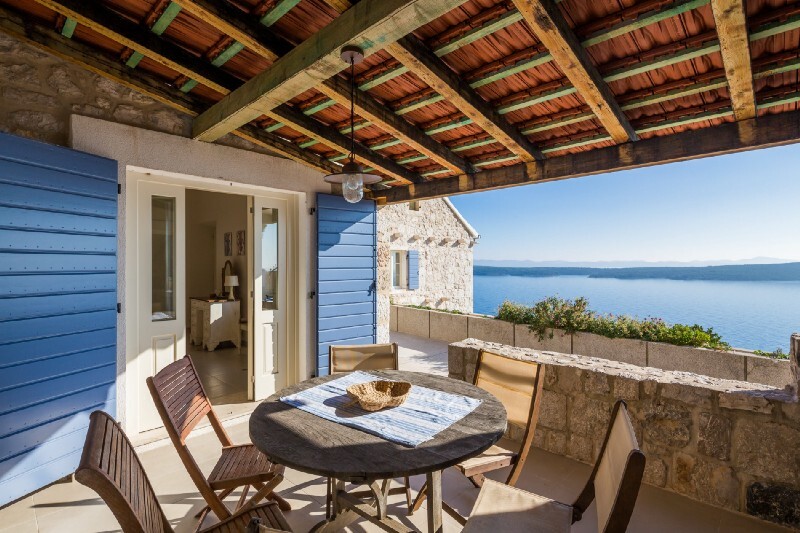 Visit and your mornings will be filled with the views of true Hvar — the azure sea, the gentle, rolling hills, the romantic village architecture. Inside, the villas are a beautiful mosaic of stone, wood, and glass. Soothing, neutral tones dominate the interior, accentuated by a sudden dash of color. When standing in the garden, do not blame yourself for daydreaming. It is hard to stay indifferent surrounded by this modern day Eden of lavender, laurel, cherries, pomegranates, tangerines, lemons, figs, and olives. Discover the underground relax zone in the basement area of the villas. A wine cellar in the stone wall. A wellness area with sauna, fitness and a whirlpool tub. A game room for younger visitors to enjoy. Let the true vacation begin. Visiting Zavala, you won’t find much of the regular tourist traps. A restaurant or two and a mom and pop grocery store pretty much sum up the offer. What Zavala has, besides its undeniable rustic charm, is an incredible selection of quiet beaches for you to explore and enjoy. Lelantos was built in 1893 and recently restored into a luxurious villa encompassing three old Mediterranean houses. Owners turned it into a real paradise, brimming with style and elegance. You can easily feel all the love and attention to detail that went into designing a perfect vacation home. Like a great Hvar wine, Lelantos only gets better with age. We hope we have helped you at least a bit to pick your perfect destination in a sea of choice. You might feel like we are stereotyping a bit here, and you’d be right. After all, there are as many ideal holidays as there are holiday goers, and only you know exactly what yours would look like. Now go and have yourself a vacation of your dreams! This is the final edition of the three-part article. If you haven't already, do check the first and second parts.